Started in 2010 by Alaina Jobe Pangburn and myself, Improbable Fictions is a staged reading series at the University of Alabama that features Shakespeare’s plays. 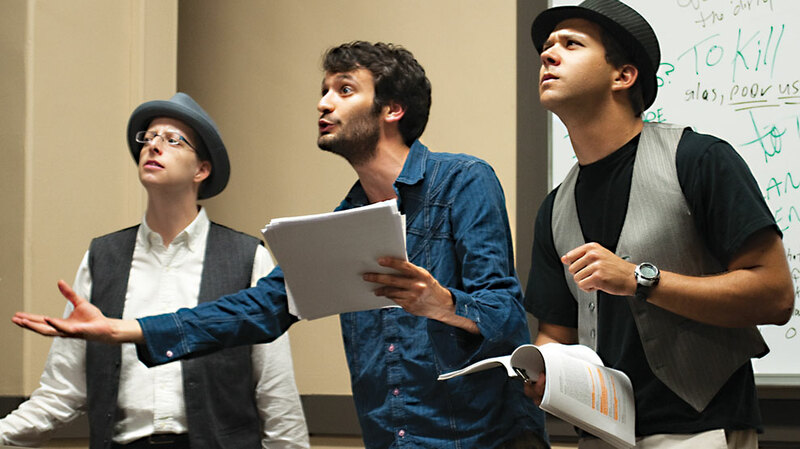 The series offers UA students a chance to see Shakespeare locally performed as they are reading his plays in their classes. Since 2010 Improbable Fictions has produced over twenty staged readings, including Hamlet, King Lear, The Merchant of Venice, A Midsummer Night’s Dream, Much Ado About Nothing, and Twelfth Night, as well as work by other authors such as Euripides’s Hecuba, Elizabeth Cary’s Tragedy of Mariam, and Henry Fielding’s Tragedy of Tragedies: The Life and Death of Tom Thumb the Great. I currently work as artistic director of Improbable Fictions, working with UA students and faculty to coordinate each semester of staged readings. Frequent directors of IF productions include: David Ainsworth, Steve Burch, Mark Hughes Cobb, Jacob Crawford, and Deborah Parker. For more information, visit https://improbablefictions.wordpress.com.